Bring the completed 6 PADI Knowledge Reviews to the last OW Dive Day. They should be answered on standard 8" X 11" paper, writing on 1 side only. Just put the problem number and answer. There is no need to rewrite the problem. Put your name and date on each page. 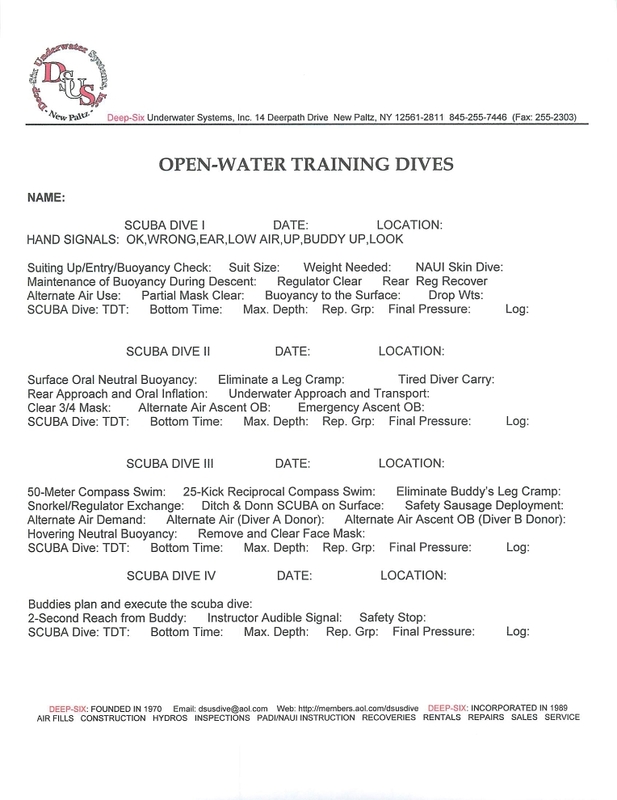 During the warmer months the schedule for the open-water dives does not change. 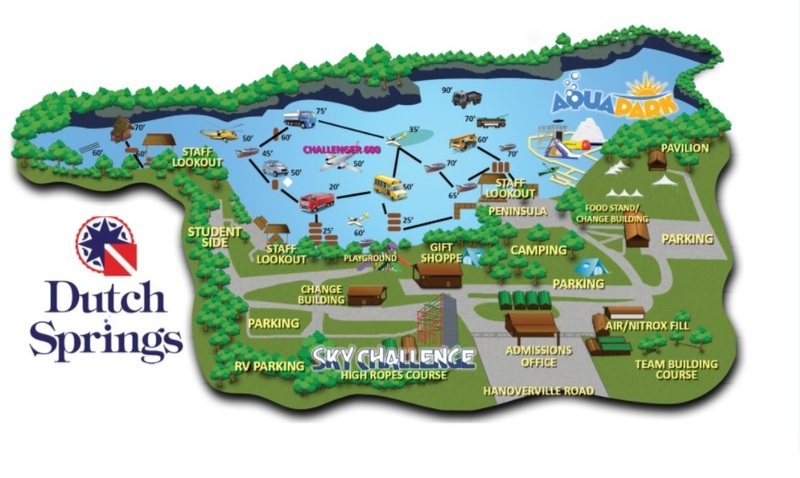 Divers should meet at Deep-Six at 0930 sharp (Lake George & Dutch Springs are 0830). Don't come early or late. Weather is usually not a factor. We dive in the rain unless it is too cold or thundering. For special notes about diving in the colder months see the last information on this page. Bring a lunch (2 peanut butter and jelly sandwiches are ideal) and plenty to drink. Bring warm clothes and gloves if the weather is cool or cold. Bring your bathing suit and a towel. For the any day of diving in Dutch Springs all divers are required to pay a $40 diving fee. Be sure to bring that fee in the form of cash, credit card, or a check. Also, Dutch Springs requires that divers sign a liability form each year. 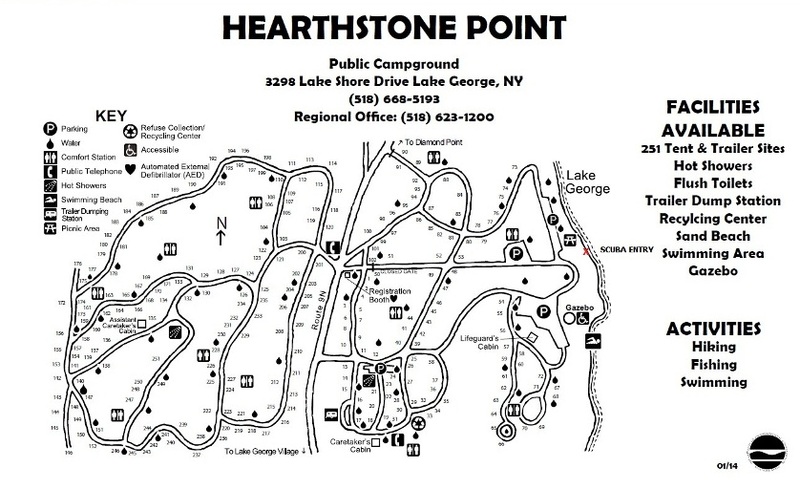 For any day of diving at Hearthstone Park in Lake George there is a $10 per car load fee. Be sure to split the cost with all the in the car. On every dive we carry 635 liters of oxygen and a first aid kit. The first aid kit is specifically for diving. On the top of the kit are the emergency numbers for that dive site. There is a set of decompression tables below the numbers. There are first aid books for use in non-emergency situations. The rest of the kit consists of bandages, rubber gloves, antiseptics, alcohol, Q-tips, matches, bug spray, Kotex, Tampex, fruit juice, sun screen, etc. The location of the first aid kit is made known to all divers. From New Paltz: Go down Main Street (toward the west) and cross the bridge over the Wallkill River. After the bridge take a right on to Springtown Road. Take the next left on to Mtn. Rest Road. Go to the stop sign and take a right on to Canaan Road. 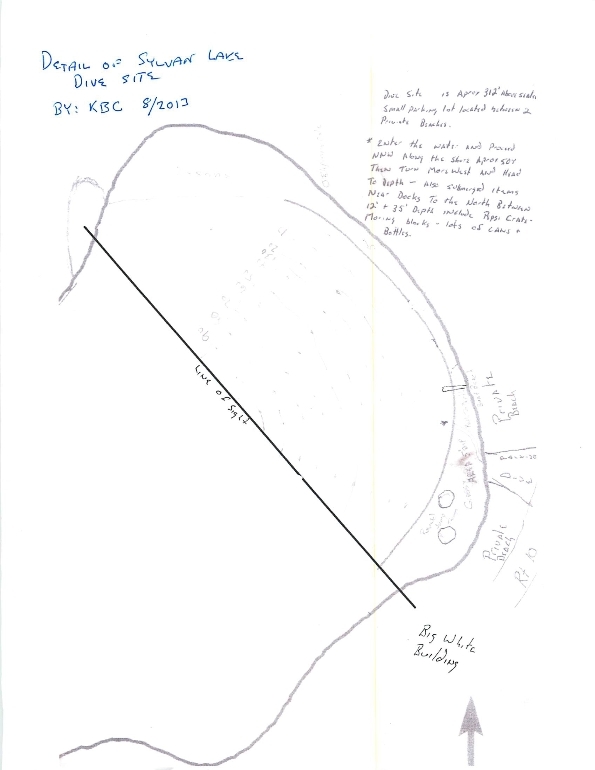 Go 1.2 miles (passing the Dead End sign) and Deerpath Drive will be on the left. We are 14 Deerpath Drive. From Kingston: Leave Kingston going south on Route 32. In Tillson take a right at the Postage Inn on to Tillson Road. Go to the end and take a left on to Springtown Road. Go 4.2 miles to Dug road and take a right. Go to the stop sign and take a sharp right on to Canaan Road. Pass the dead end sign to Deerpath Drive and take a left. We are 14 Deerpath Drive. Make sure your buddy's tank is turned on. If there is a reserve valve ("J" valve) on the tank, the lever must be in the down position - reserve off. Have them put their hand on the weight belt buckle and/or integrated weight handles. This insures they have put the weights on, and they can find the quick-release for them in an emergency. Most important: Look at the tank pressure gauge and press the BCD inflator button. If the pressure drops, the tank is not on! If the BCD does not get air the connection is not proper. This is the most important of the four checks. Bring a Thermos filled with hot water to put in parts of your wet suit, in your boots, and gloves. Bring warm clothes, hat, and gloves. 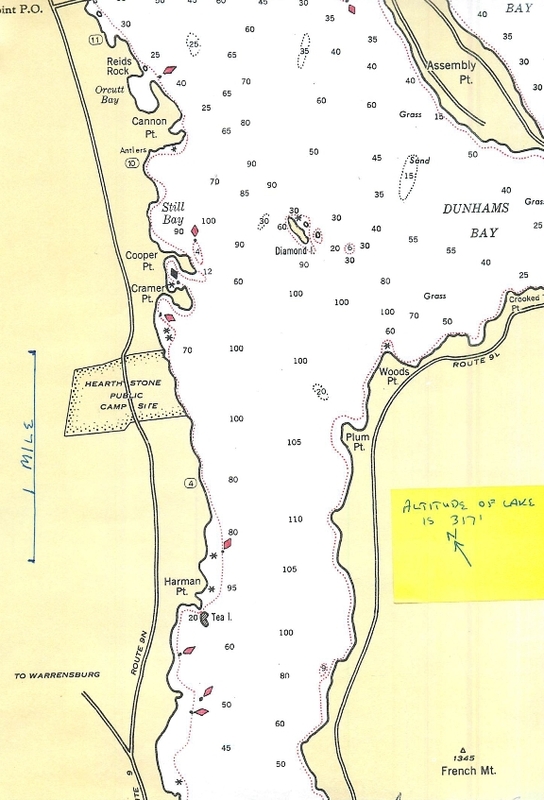 The following 4 sonar maps are the locations where Deep-Six does open-water scuba dives. The first map is Mohonk. We dive from Open Camp (middle of the east side of the lake). The depth line intervals are 5 feet apart. The altitude of the lake is 1223' so it is a high altitude dive. 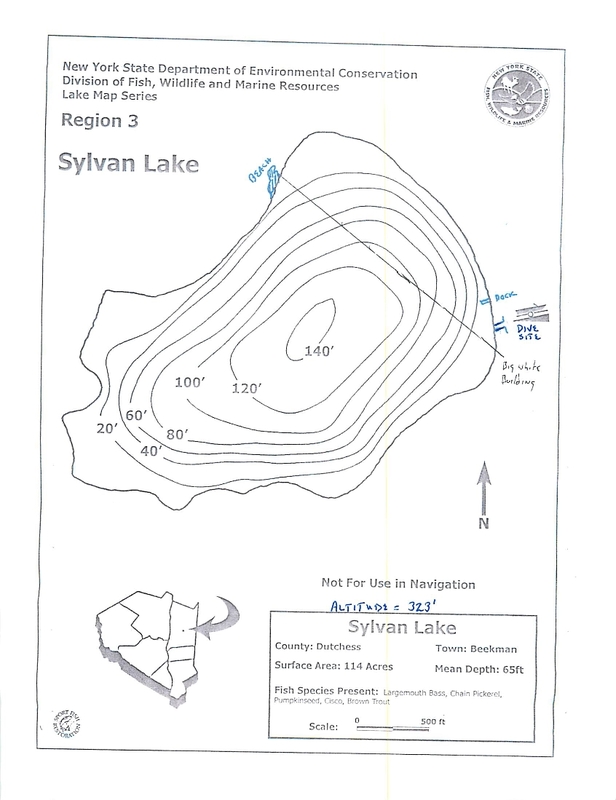 Download a PDF Image of the Mohonk sonar map above. 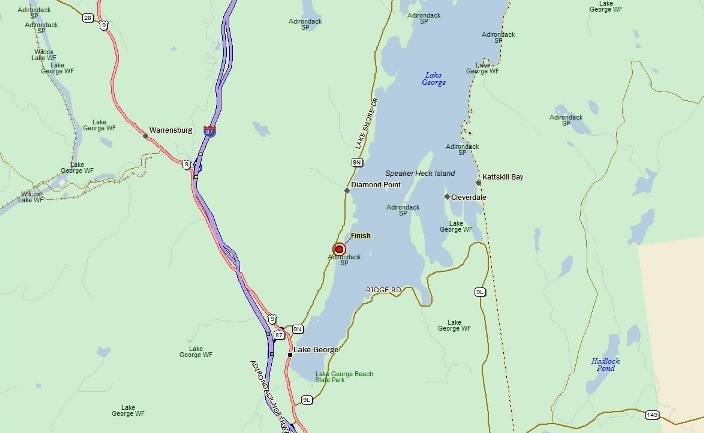 Lake George from New Paltz is 132.86 miles and should take about 2.4 hours. Dutch Springs in Pennsylvania is one possibility for the last 2 open-water dives as long as Minnewaska remains unsuitable. The Advanced Deep Dive is done on the boat that is to the right of the school bus. It is 70' deep. All dives are done from the Staff Lookout/Peninsula. 21 B (78 West) on 287 is the exit for Dutch. 191N to Hanoverville Rd at 2d traffic light. DS on left after the railroad. Directions to Big Pond From New Paltz: Take 299 west to Rt 44-55. Go right on Rt 44-55. Follow 44-55 to the end and take a left toward Ellenville. Follow Rt 209 to the traffic light in Ellenville at Rt 52. Go right on Rt. 52 and go to Liberty. Go right on Rt 17 (I-86) headed west. Take Exit 96 Livingston Manor. Go right at the exit end and then right on Old Rt 17. Go 1.3 miles to take a right on Beaverkill Rd. Go 11.6 miles and take a left to cross a stream. Go on Big Pond Rd 0.8 miles to the dive site. The trip is about 70 miles and will take about 1 and 1/2 hours. Alternate Route: Take Albany Post Road in New Paltz to Route 17K. Go right on 17K to Bloomingburg. Go on Route 17 (I 86) west to Exit 96, Livingstone Manor. Follow the directions above to get to Big Pond. The trip is about 81 miles and take the same time. Directions to the nearest hospital: Vassar in Poughkeepsie: Take Sylvan Lake Rd(at dive site) north to SR 82. Go on the Taconic State Pkwy N to Noxon Rd exit. Right on Noxon Rd (N), go 5.5 miles to Rt. 55. Go left to Rt 44. Go left on to S. Hamilton. Right on Montgomery St, left on Academy St, right on Franklin St, left on South Ave, right on Dean Place, left on Lincoln Ave and proceed to the hospital. Directions from Vassar (nearest hospital) to the dive site: Left on to Lincoln Ave, right on Dean St, left on South Ave, right on Franklin St, left on Academy St, right on Montgomery St, left on South Hamilton St, right on Route 44, stay right on Route 55. In 1.5 miles go right on Noxon Rd. In 5.5 miles go south on the Taconic State Pkwy. Exit at SR 82 North (2nd exit). Go right (north) about 100 yards to Sylvan Lake Rd. Take a right and go 4 miles until you see the lake and the dive site on the right. 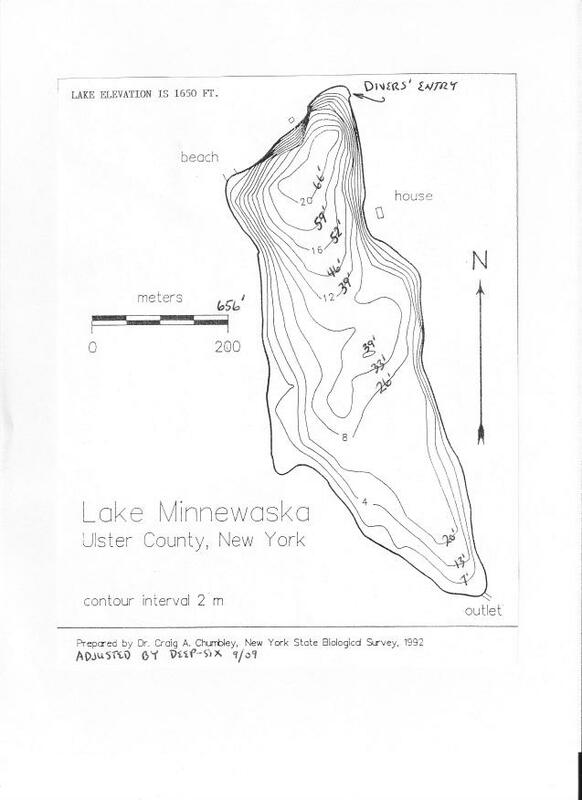 Download a PDF image of the Minnewaska Sonar map above. Your DAN Insurance will expire when you become certified, usually at the end of the 4th open-water dive. You may wish to purchase DAN insurance by calling them.